This week offcially marks the start of the 6th month I’ve been away from home. That’s the longest I’ve ever gone without making a trip back to Missouri, and I certainly am feeling it. I don’t know if it’s the weather or the upcoming holidays, but I am ready for a trip back. Unfortunately, I have to wait a few more weeks until Thanksgiving. I’ve been thinking a lot lately about family… about how it’s so foundational, but it spreads far beyond foundation and becomes intertwined with every bit of life. I’ve been so lucky to have the family I do; I’m so so lucky. To the family that raised me and to the family that I gained 4 years ago, you’re family that has chosen to love me even after you were forced to love me – to all of you back in Missouri – I love you, and I miss you, and I’ll see you soon. 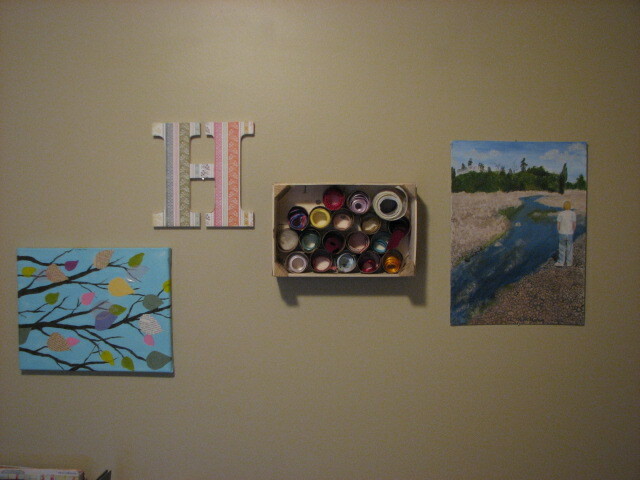 Once or twice, I have mentioned my craft room, my art room, or when I’m feeling fancy… my art studio. 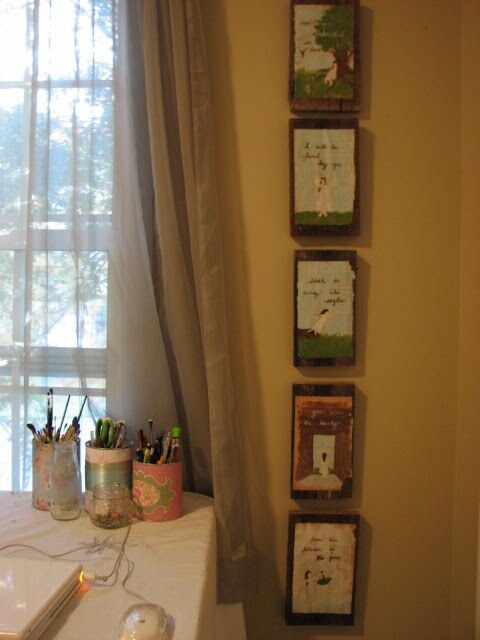 It is usually just a room where I can pile all my tiny scraps of paper, get paint on the furniture, and hang up whatever decorations I want without the husband getting annoyed. Me and my tiny bits of paper are like him and his cords. Millions of cords. All sizes and lengths. All different purposes. All over the house. On a seemingly unrelated note – I’ve been sick for 5 days. A flu, perhaps, nothing of the swine variety, but annoying nonetheless. Because I’ve been sick for what seems like months and have hardly left the house (with the exception of a double feature at the drive-in, and a trip to buy some new fall clothes – half off all clearance, folks. Even sickness can’t keep me away from deals like that) here comes the relation to the craft room… I was inspired to organize. I moved furniture, which I don’t recommend doing if you’ve been asleep for 14 hours earlier that day, hung artwork and inspiring things, and finished up TWO projects that really didn’t need to be finished. It felt good. It feels good. I’ve been sitting in here as much as possible, when I’m not sleeping or moping in front of Dave so he’ll feel sorry for me. The prettiest tree in the neighborhood just happens to be outside the window of my art studio, yes, it feels fancy today, and the yellow and orange leaves are creating some serious fall motivation. I feel very much like I’m a bear going into hibernation. Getting my cave ready for the long haul. Also packing on a few pounds, but that’s not really a good thing, it’s just a can’t-stop-making-hearty-soups-and-chili thing. 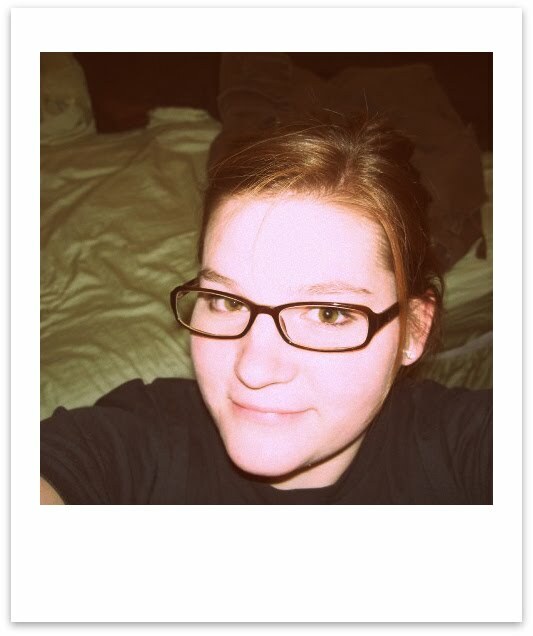 Because I’ve finally cleaned things up in here, I decided to take some pictures for the world to see. Documentation that I can, in fact, be an organized artist. 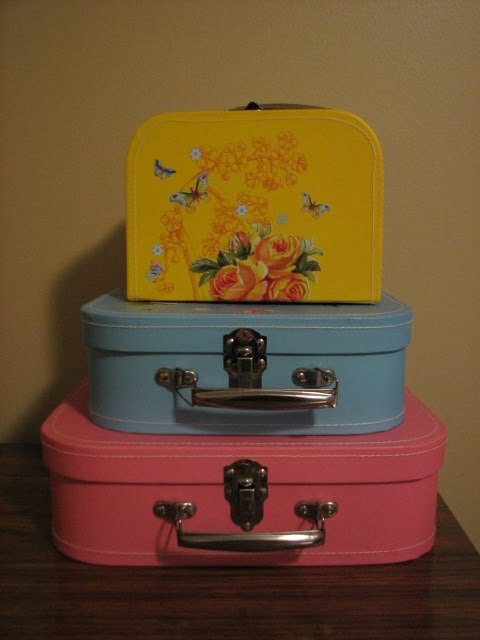 These little suitcases are just the cutest, right? I wish I knew what brand they were. They house embroidery floss, buttons, and ribbon scraps. 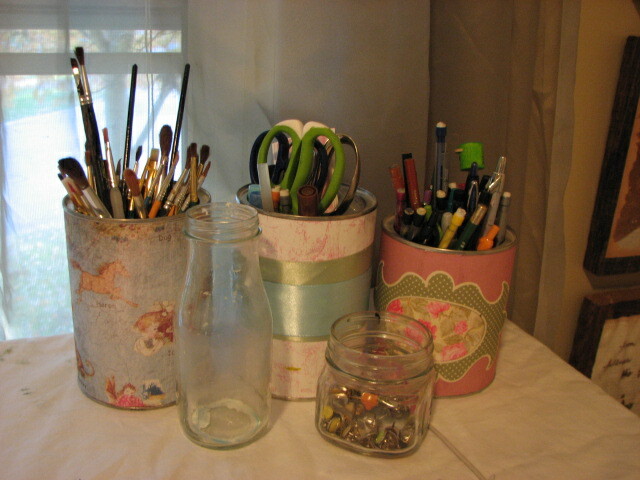 Yes, I have a container for ribbon scraps. 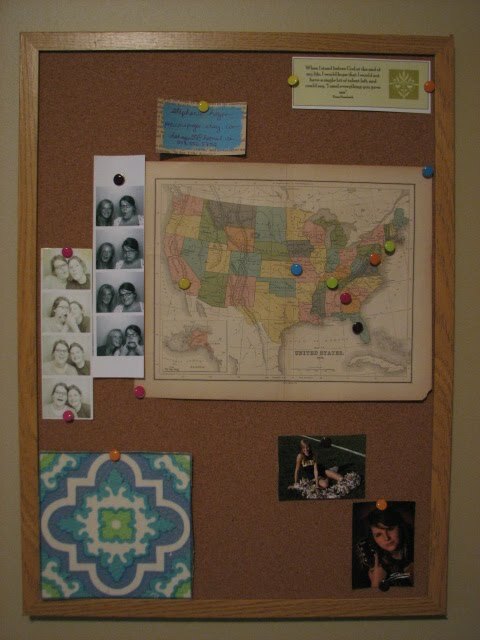 This bulletin board is a work in progress. The funky pattern in the bottom left is a tile from my grandma’s old bathroom. I want to frame it someday. The map (which I bought thinking it was about 4 feet wide, long story) has little push-pins in the places to which I’ve sold artwork. And pictures of my sisters – wonderful artsy girls. I finally found a place to hang these paintings, which I’ve been wanting to hang since I made them. Here’s the description of these pieces. 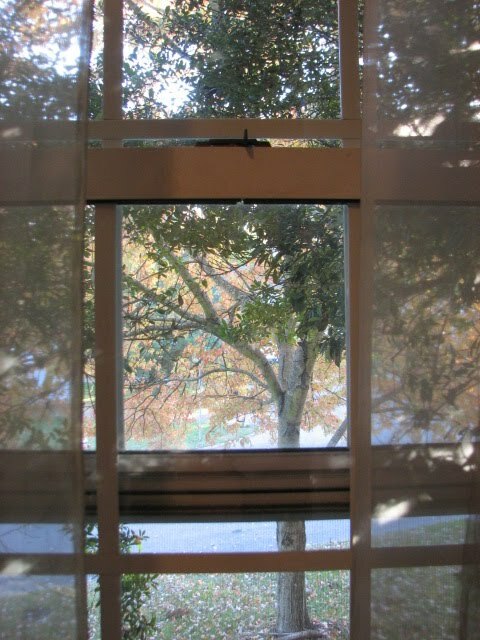 This is the beautiful tree out my window. Not really anything to do with my organizational skills. But, pretty. A DIY project I’m pretty proud of. Mixed nuts tins wrapped in pretty papers and ribbons. See, Dave… I do have a use for ribbon scraps. 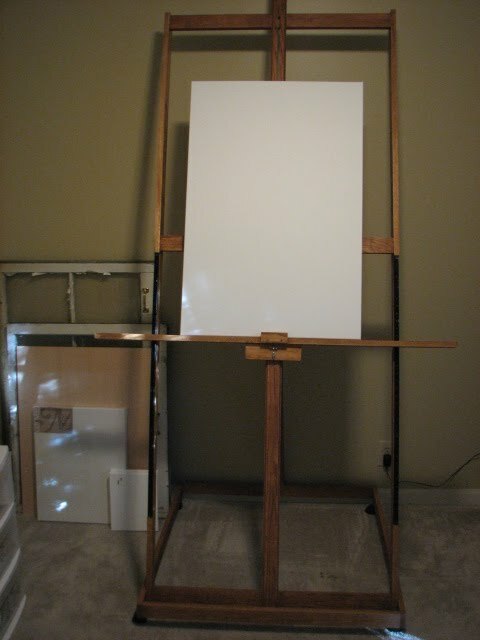 This easel is amazing! My dad hand made this for my wedding gift. It’s huge and awesome. Be jealous that your dad isn’t as cool as mine. This wall is a work in progress also. The painting on the left is a copy of the first painting I sold. The swirly, colorful thing in the center is a ribbon holder. My good friend, Lillian is going to post a how-to of one of these on her blog soon, so I’ll let you know when that happens. And the painting on the right is one I did in high school. It’s a painting of Dave from when we took a trip to Seattle for my brother’s graduation. It’s one of the first paintings I did… and it’s really more sentimental than impressive. This weekend, I did something I haven’t done in 18 years – since my sister was born. 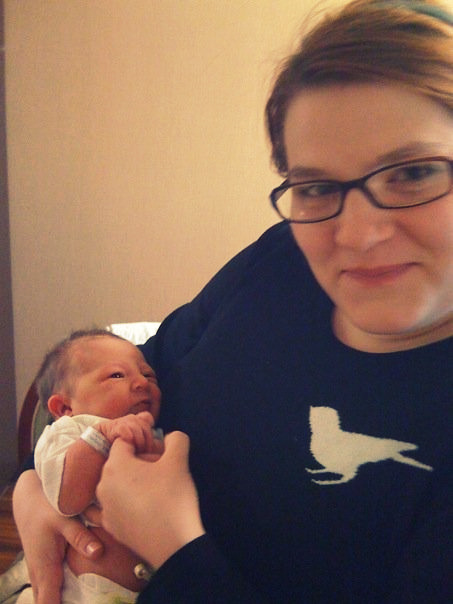 I held a day old baby. Sorry the picture qualitiy isn’t any better – but it’s pretty decent for a cell phone picture. This is my friends first little one, Abigail Katheryn. The doctors told them that on a scale of 1-10 they measure “perfection” for each newborn, and little Abby got a 9.9! I just can’t imagine what that .1% is. Possibly she’s just too cute, and that .1% is because they couldn’t believe she was that precious. She even opened her eyes for her photo shoot. Sure seems like a 10 to me. Congrats Chris and Beka on a perfect and beautiful baby girl! Something strange has been happening to me lately. I don’t know what started it, why is has shown itself in my life, or how long it will last. It looks different than anything I’ve experienced before. I’m pretty sure that it’s contentment. I’ve had such an overpowering sense of peace in the past few months and it’s been strange to see. I tend to be the type of person who is always looking ahead to the next big thing in life, and I get anxious to change my surroundings (literally and figuratively). Even though several things I’ve been excited about have kind of fallen through – such as the nannying job I was so looking forward to, a couple of big art sales, and other miscellany – I’m just in a place of peace and joy. A therapist told me once, “Joy and happiness are two very different things. You need both. Happiness is letting the outside in, joy is letting the inside out.” So, I’ve been allowing happiness to seep in without the anxiousness that usually blocks it. I’ve prayed hard for this peace to last, for me to truly understand the hope God has given to me, and it’s been followed by such joy. Filling me up and gushing out. Helpful tip – If you click on these images, it will take you to a larger size. 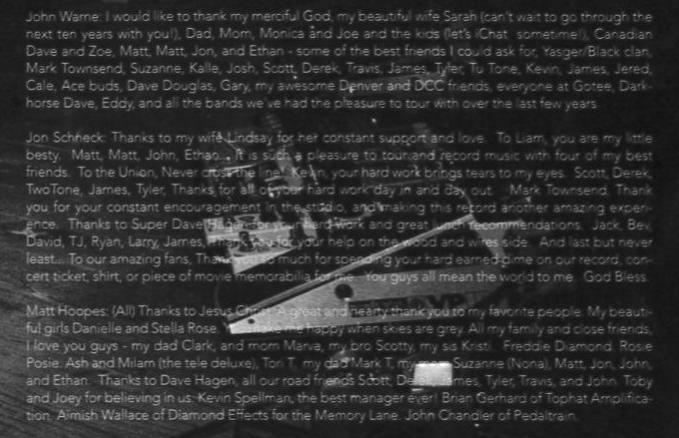 So you can actually read it. I know I’m beating you over the head with this – but seriously, it’s so cool. 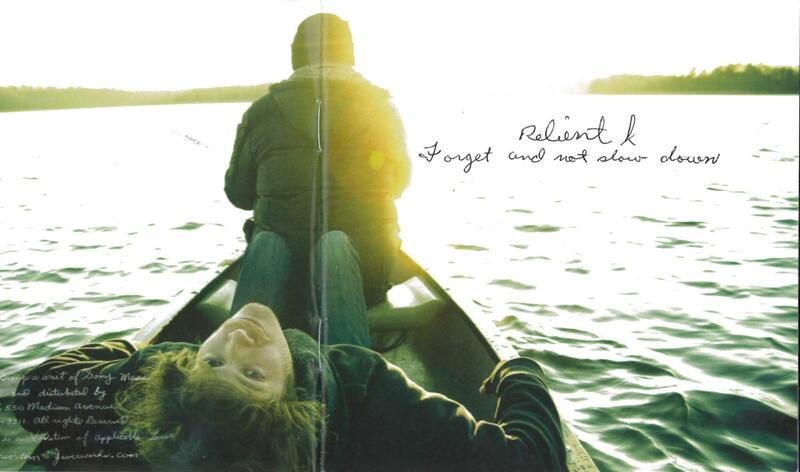 These images are from the Relient K album that Dave worked on. His name is in there. Repeatedly! (Dave Hagen, Dark Horse Dave and Super Dave Hagen [my personal favorite])They’re kind of hard to see here, so I suggest going out and buying it. 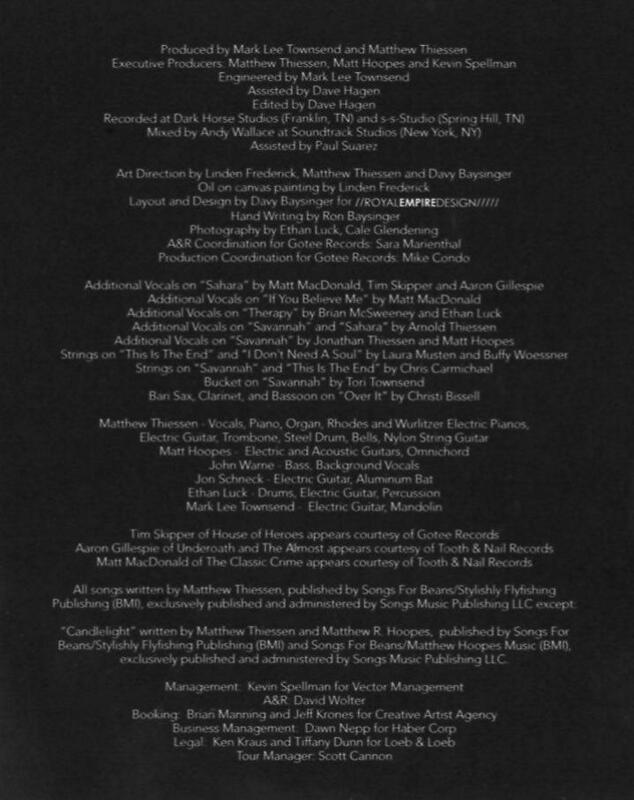 It’s a great album, plus, he can even sign it for you if you want. I don’t say it enough – but I’m awfully proud of that husband of mine. He was working 100+ hours per week while doing this project. That’s literal hours, by the way. He was waking up at 5:00 every morning to work 6 hours or so at a job that’s not fun just to help out with bills and neverending car repairs, and driving straight to the studio to stay up until the wee hours of the morning – because that’s what we’re here for. Rinse, repeat. To the guy who deserves more than I or the music business can offer – congratulations. Last night was the first craft night in, I hope, an ongoing tradtion. Great fun (and homemade chex mix) was had. Crafts were started (few finished), friends were made, and coffee tables were dirtied. Couldn’t have been more fun. While we were busy giggling and making stuff, I quickly realized how lucky I was to have such sweet, creative friends. I can see this lasting a very long time. When I was younger, we used to go to St. Louis to my great-aunt’s pumpkin patch. 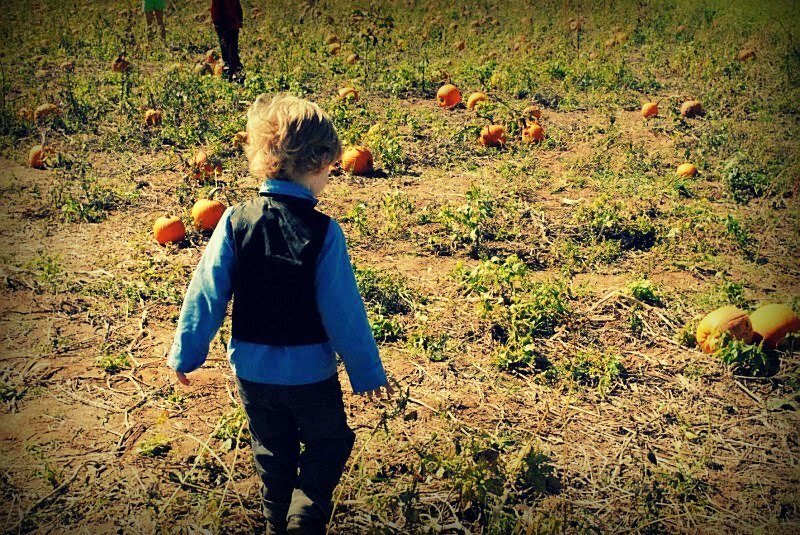 Hay rides, pick-your-own-pumpkin fields, and much, much more. It was the greatest expereince as a child, and I still get excited every fall when I think about taking a trip to a pumpkin patch. Though my great-aunt’s farm is 6 hours away, there is one just south of Nashville, about 30 minutes from our house. We went this past weekend with some great friends and had a blast. My friend Angie took these photos while we were there. They had some amazing bunting up in the barn, made out of bandanas! Brilliant! I’m planning on doing this someday on my back porch perhaps. 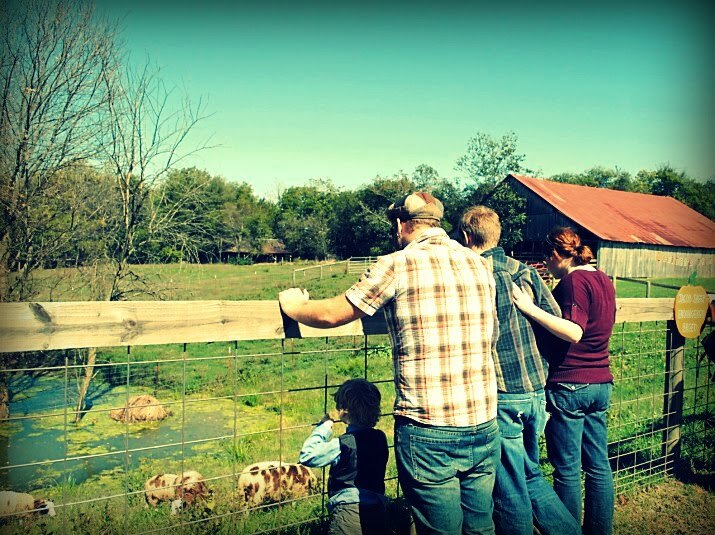 This is Logan, Dan, Dave, and me checking out some amazing sheep. They’re an endagered breed, I guess. Very soft and spotty.